If knitting were music, the basic stitch counts could tell you the rhythm (or time), and the knits and purls could be the notes. If knitting were music, a simple two by two rib could be translated to the Key of C (no sharps or flats, just natural notes), in 2/2 time (or cut time). Based on the musical scale Key of D, two stitches become sharps, and move across the front of the leg and top of the foot, in a simple melody that starts with a simple rib, and riffs to become a song for your feet. 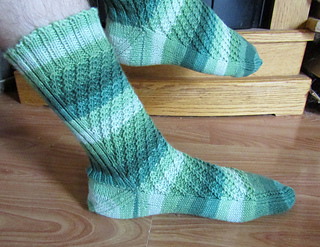 Knit from the top cuff down, these socks include an afterthought heel and wedge toe. 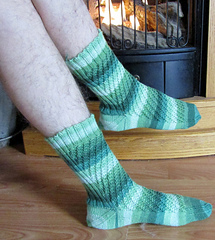 Suggestions are provided for using contrast yarns and optional compression foot.